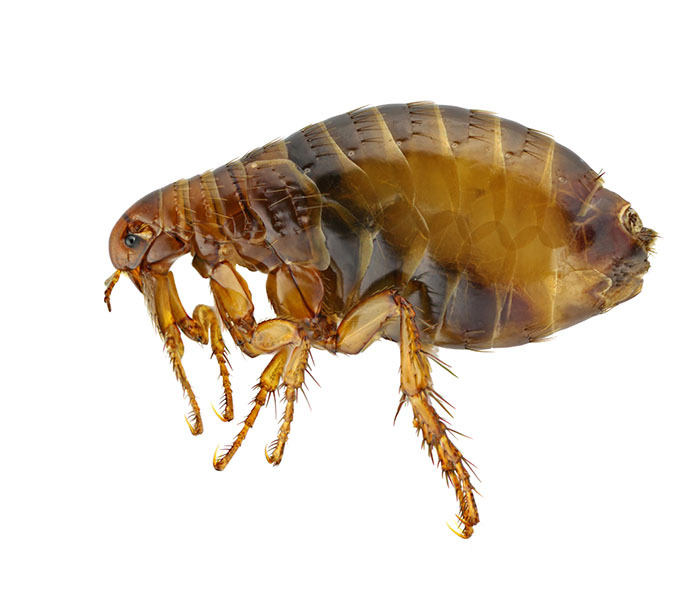 Fleas lay eggs in bedding materials of pets or on the pets themselves. A single female may produce 800-1000 eggs in one life time, which can be as long as two years. The larvae thrive on organic matter and adult flea excrement. At any one time a cat bed can host an infestation of 8000 eggs and larvae and 2000 mature adult fleas. Firstly before we can carry out any treatment you cat or dog should be treated with a product supplied professionally, or bought from a reputable store. A thorough treatment to all floor and fabric areas is required. We use the most up to date insecticides with hormone growth regulators to eradicate and break the life-cycle of the insect. A four hour exclusion time is needed after this treatment is completed. In Europe, fleas are not generally responsible for the transmission of disease. However, they are still objectionable because of the bites they inflict and the deep-rooted social stigma attached to humans with flea infestations. Flea bites are identified as a tiny dark red spot surrounded by a reddened area. The bite persists for one or two days and is intensely irritating. First bites are not generally liable to cause serious infections, but they may lead to hypersensitivity. bite marks on the body, particularly around the ankles and lower leg.